Zombies and monsters, isolation and terror—Resident Evil’s certainly got them, but they’re hardly the series’ strengths. With the exception of the very first game, Resident Evil is more often unnerving and stressful than outright scary. Interlocking, densely detailed spaces are the skeletons that prop up Resident Evil’s best bodies, and memorable character pairings are the heart. From strangers trying to survive in a siege-ravaged police station to a special agent protecting his ward in a madman’s Spanish villa, this is the Resident Evil secret sauce. Resident Evil: Revelations 2 has half of the formula in place for its first episode, but it’s missing the foundation of the other. Opening with a blunt but chuckle-worthy infomercial for TerraSave—a monster-fighting NGO with the slogan “Because ‘terr’ doesn’t have to end with ‘orist’”—Revelations 2 pulls off a few impressive feats. It capably invites neophytes into a ridiculously named sequel with a simple, appealing setup. Claire Redfield is a veteran anti-bioterror campaigner, and her friend Moira Burton has just officially joined TerraSave when the two are kidnapped at gunpoint during a posh dinner party. When they come to, they’re trapped in a crumbling island prison populated by aggressive, warped freaks straight out of a Troma flick, and a disembodied voice taunting them from afar. All of this also ties into 20 years of batshit Resident Evil continuity with surprising cleanliness. Claire was one of two leads in Resident Evil 2, while Moira is the daughter of the original’s Barry Burton—who turns up halfway through the episode. For the faithful that have stuck with the series as it’s bloated and mutated over the years, these characters with simple but memorable history act as a welcome anchor. Their implied history in the game’s opening moments is enough to explain the way they work together when exploring the island. 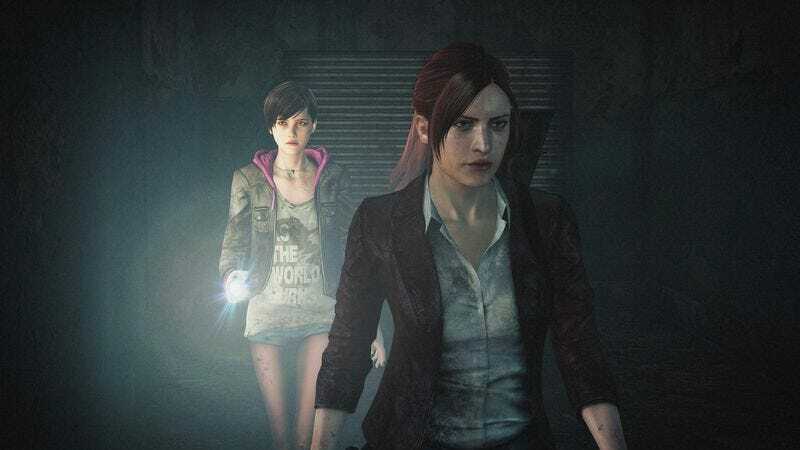 Claire and Moira, and later Barry and young newcomer Natalia, have to be controlled in tandem, and the interplay between each duo gives Revelations 2 a richer flavor than any other recent Resident Evil. Claire is the fighter, quick to reach for the guns and knives found on the island, while Moira is staunchly anti-gun. Despite hinting at painful history related to both firearms and her father, she’s all too happy to bludgeon attacking freaks with a crowbar, but she also backs Claire up with a flashlight, finding hidden items and lighting the way in dank corridors. Switching between the two helps create a tangible bond as you play, never feeling like a needless gimmick that spreads out basic tasks to freshen an old formula. Tapping a button to snap to Moira so she can finish off a monster after Claire shotguns it to the ground enhances the connection between player and character, similar to the original’s awkward controls. Barry and Natalia work differently but are equally effective at sucking players into their plight. As tends to happen with playable children in horror games, Natalia isn’t much for fighting but she’s certainly good at crawling through the myriad, conveniently placed holes in the walls near locked doors. Were that the extant of her skills, her and Barry’s sequences wouldn’t feel distinct. Luckily she’s psychic, so crouching and sneaking expands her ability to sense enemies in the environment. They show up with a hazy outline ahead of you so Barry can sneak up and kill them without wasting precious ammunition and healing resources (both of which have become a scarcity again in the world of Resident Evil). Forced stealth can be the kiss of death in games like this, but when you’re sneaking through a pitch black forest at night, trying to hold onto a few bullets, swapping between Barry and Natalia feels as intimate as it does discomfiting. The island is suddenly a dangerous place and these two rely on one another even though they just met. As rich as Revelations 2’s characters are, though, the island is a drag. In this first of four episodes, both teams work their way through the prison on the way to a radio tower. While the path doesn’t feel like rote, economical recycling, the overall blandness of the place brings down the trip. Gray room follows gray room, yielding to drab junkyards and woods that are spooky in the moment but forgettable minutes later. Even though it’s a treat to explore a few different paths again—a break from the hallway shootouts of Resident Evil 5 and 6—the island is devoid of the creepy, goofy specificity that marks the series’ best settings. There’s never a weird bar with a player piano, no shack with a secret shrine covered in candles and moldering food. With everything so blank, with no sense of history, the otherwise engaging characters are set adrift in a place that’s too drab to feel real or beguilingly unreal. A more forgivable misstep is the shoehorning of a character skill tree with unlockable abilities and scattered weapon upgrades, both of which come off as needless nods to modern design trends. For once, it would be nice to just play a game where you have tools, you use them, and there’s never an arbitrary menu of numbers. Resident Evil: Revelations 2 can remedy the first episode’s greatest flaw as it goes on. With three episodes left, it’s possible Capcom’s building up to more grand locales. After all, Claire’s last starring vehicle, 2000’s Code: Veronica, started in a drab military base before the freaky short range submarine rides and arctic facilities overrun with plant tentacles.